At Sipe Steel Rule Die, Inc., we produce precision die cut products augmented by a number of value added services. The project highlighted here was die cut, collated, and packaged for a furniture manufacturer. They are designed as drawer inserts, which are used to allow color changes on the drawer faces for a line of children's furniture. Composed of a high density polyethylene (HDPE), with a textured finish, each kit contained 9 individual colors. Material thickness varied from .016" for the colors, to .020" for the clear. 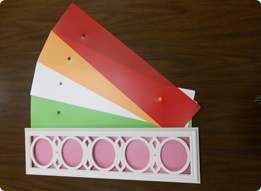 Extensive research was required to determine a plastic source, match color samples, and meet dimensional specifications. The dies were created in-house which produced dimensions of 24.33" in length, 5.51" in width, .2" radiuses, and 31/64" diameter holes. Tolerances of ±.015", were achieved using our Sanwa 1060 die cutter, this system features stripping abilities, which cleanly removes hole slugs and waste. After completing the 3,000+ packages that this customer required, we also provided them with stocking and fulfillment, shipping packages as needed to sites in Arcadia, Wisconsin and Shanghai, China. These inserts are used to change the facing color of a drawer on children's furniture. Sanwa 1060 Die Cutter w/ Stripping abilities to remove hole slugs and/or waste. Parts matched to specific dimensions provided by customer.